Missy Pfohl Smith grew up in Buffalo and received her B.S. in Dance from the College at Brockport. She moved to NYC in 1993 where she started studying and working as an apprentice for the Erick Hawkins Dance Company. At the same time, Smith became a founding company member and later the Assistant Rehearsal Director of Randy James Dance Works, with whom she toured nationally and internationally from 1993-2003. She also performed nationally with Paul Mosley from 1997-2004 and with various independent artists including Philippa Kaye and Kriota Wilberg. In 2002, she received her MFA in Choreography and Performance from Sarah Lawrence College and founded BIODANCE. After working for 12 years in NYC, she relocated the company to Rochester, NY in 2004, where she has since been active creating new work for BIODANCE as well as performing with choreographers including Bill Evans, Anne Burnidge, Sarah McCormick, Courtney World and Cadence Whittier. She has also been active in filmmaking, both in collaborations with her own choreography as well as performances in documentaries and experimental films. 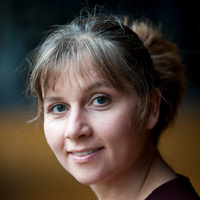 Smith is currently the Director of the Program of Dance and Movement at the University of Rochester. She has recently served as an Assistant Professor in the dance department at Hobart and William Smith Colleges and serves on the Board of Rochester Contemporary Dance Collective. Smith has performed and taught dance from beginners to professionals across the U.S. and in Poland, Germany, Estonia, Latvia & Japan. She has received Individual Artist and Company grants for her choreography and for BIODANCE events and educational dance residencies from the Arts Council for Greater Rochester, the New York State Council on the Arts and the NY State Legislature, Westchester Arts Council, the HWS Center for Teaching and Learning, United University Professions and Career Transitions for Dancers. BIODANCE is a nationally emerging contemporary dance company of "some of the area's top modern dancers" (Anna Reguero, Democrat and Chronicle) led by Founder and Artistic Director Missy Pfohl Smith. A non-profit organization, BIODANCE is committed to artistic excellence in the creation and performance on innovative dances, dance theatre and dance film through collaboration with multi-disciplinary artists. BIODANCE performs repertory by a roster of internationally recognized choreographers including Missy Pfohl Smith, Bill Evans, Randy James, Ivy Baldwin and Jeanne Schickler Compisi. The company explores social, political and environmental issues through its works and interacts with and outreaches to its community members in a variety of ways through performances, benefit concerts, interactive lecture-demonstrations and classes in venues such as Geva's Nextstage, Hochstein Concert Hall, MUCCC and more! BIODANCE has performed in a variety of venues in NYC and NY state, most recently at the DUMBO Dance Festival. Nationally the work has been performed in MA, OH, UT, ID, NH, NJ, VT and WA.